The beryl group is most famous for emerald and aquamarine, two of the classic colored gems. But there are lesser-known beryls that are popular for jewelry. They include the peach or pink-colored morganite (named after the banker and gem collector J.P. Morgan), the yellow or golden beryl once known as heliodor, and the colorless beryl known as goshenite. All the members of the beryl family are beryllium aluminum silicates by chemical composition and have a very good hardness of 7.5 to 8 on the Mohs scale, so they are suitable for all kinds of jewelry. Beryl has a refractive index of 1.577 to 1.583 and a density of 2.72. Pure beryl is actually colorless and the different beryl colors are the result of trace elements. Emerald is colored green by chromium and vanadium, while aquamarine and yellow beryl are colored by traces of iron. Morganite derives its peach or pink color from manganese. The first major deposit of yellow beryl was found in Namibia in 1913 by a German mining company. They named it heliodor from the Greek for "gift from the sun." Since then other deposits have been discovered in Brazil and Madagascar. The term heliodor is now seldom used. 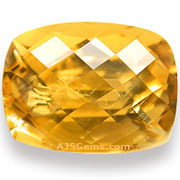 The term "yellow emerald" also been used to refer to yellow beryl, but this term is misleading, since emerald is always green. 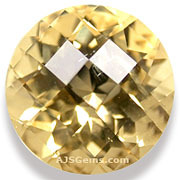 Golden beryl colors range from a weak yellow-green to lemon-yellow and golden-yellow. Saturated colors are more valuable, but your choice may depend on your jewelry design. Golden beryl is almost always untreated (indeed it may lose its color if heated). Some yellow beryls may be produced by irradiation. 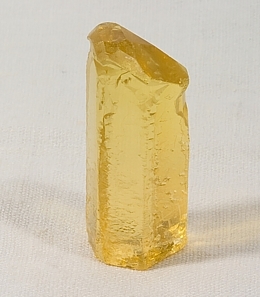 Yellow beryl has excellent transparency and a vitreous luster. It is generally quite clean, but minor inclusions are common and acceptable if they don't detract from the beauty of the gem. Larger sizes (over 5 carats) are not unusual and prices are still very reasonable. 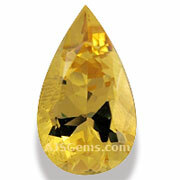 Golden beryl is a popular alternative to the more expensive yellow sapphire. You will find a wide variety of cutting styles available. Emerald cuts with large step facets will show off the color, while smaller facets in portguese or checkboard cut will provide more sparkle. You will find a large variety of shapes as well, from rounds and ovals to pears, trillions and rectangles. Golden beryl deposits have been found in Brazil, Madagascar, Namibia, Nigeria, Sri Lanka, Tajikistan and Zimbabwe.